Choose Aprica for your ski holiday with all the family. 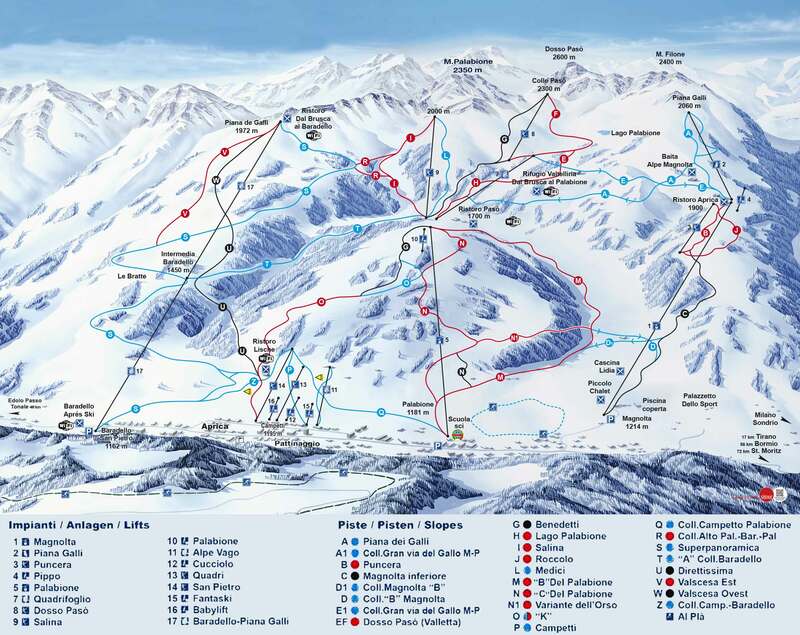 You can enjoy joyful skiing in more than 50 km of downhill slopes (pistes), gain suntan in the warm, sunny days. Besides the skiing, feel free to enjoy winter ice skating rinks, climbing walls, ski touring and snowshoeing experience as well as swimming pools and wellness centers. The resort also offer different entertainment programs - local food and wine tastings and lot more. Aprica is a ski resort in northern Italy in the province of Sondrio. The resorts main source of income is tourism, especially skiing in winter. It is a great resort for ski holidays, because it is one of the few resorts with ski slopes ending in the village itself, also this a an area, where snowfalls are often and strong wind is rare. Developing our prices, we avoid flat pricing structure. Offering transfers to Aprica, we consider several factors to offer you the best possible deal for your transfer to Aprica. In developing prices this way, we can offer the best possible value for money. Aprica is great ski resort for everyone. The resort provides an incredible experience for all skill levels across the board. From first-timers to seasoned pros, there’s plenty on offer for everyone. If you are travelling with all your family, Aprica is the right place for it. Aprica offers several activities for your children. Here are many places children can play, enjoy the rides with inflatables, indoor and outdoor attractions or try to climb up the climbing walls. Area also offers professional ski schools to introduce your younger family members with winter sports. Alps2Alps are working hard to deliver the total package of high-quality service with low and agreeable prices. You can trust us to be flexible, reliable and punctual. To get a peaceful and comfortable transfer for the best price to your ski resort, book with us in advance. Feel free to contact the Alps2Alps team if you have any question or you can not find a destination who fits you. If you want to get your trip to Aprica off to the best possible start, call us!